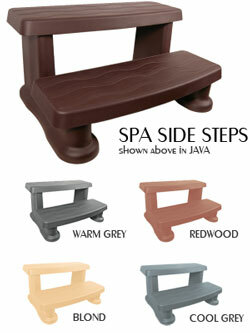 The All-Weather Spa Side Step has taken durability, style, form, and function to a whole new level. Only the All-Weather Spa Side Step has the ability to satisfy the look while making safety the priority. Offered in a range of colors sure to compliment any spa. Welcome to the All-Weather Spa Side Step from the makers of Cover Valet. They make spa use effortless. - Supports more than 800lbs. - UV treated ensuring years of beauty and use. - Unique anti-slip tread design provides added safety and peace of mind.